It was all shiver-me-timbers and avast, me hearties! at pirate and sailor-themed ‘gang show’ at Camelot Care House and Lodge nursing home in Wellington. 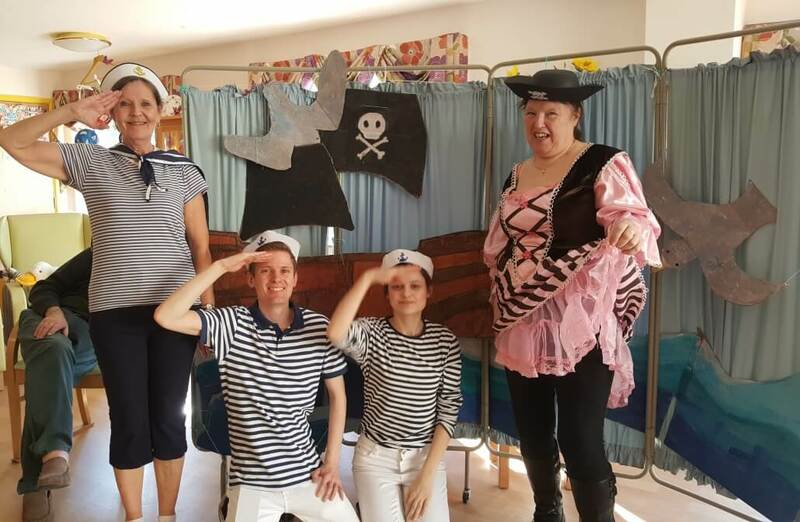 The show, which included songs and music with a nautical theme, was performed by the care homes’ activities’ team in front of an audience of delighted residents. “We’re big on audience participation here,” said activities team’s Richard Dempslake, “and the show certainly didn’t disappoint. The show is part of an on-going project by the activities’ team which involves residents making the props and backdrop for the show. “Music and singing are believed to activate specific areas of the brain and act as a cue for autobiographical memories,” added Richard. Camelot House and Lodge is run by award-winning specialist dementia care provider Camelot Care, which also runs Avalon Nursing Home in Bridgwater and Freshfields in Plymouth.